As more of our funded studies produce and publish results, we’re working to ensure our stakeholders are aware of this progress as soon as possible. It’s part of our mandate to conduct research that helps patients and those who care for them make better-informed healthcare decisions. People interested in the outcomes of specific projects can now receive alerts every time one of those funded projects has results. We developed this service in response to requests from our stakeholders. To track the progress of a study, you can now go to any study project page and click the green “Sign Up for Updates” button in the upper right corner. You’ll receive email updates when that study has patient-friendly and professional results summaries posted to the PCORI website, or when a journal article on primary research results is published. This effort is part of our ongoing commitment to engaging stakeholders in all aspects our work, with the goal of maximizing the value of the research we fund and its ability to improve the value of health care. Please add my name and email to your update list. Hello. Are you requesting to subscribe to our weekly email alerts? Hello. Thank you for your comment. The project is currently underway and we will report more information on it soon. I would like to get updates on PCORI funded studies. Thank you! Hi LReedsBooks, thank you for your comment. If you are interested in receiving our weekly emails, which include various types of updates and content about our funded studies, you can subscribe here. Meanwhile, if you would like to track the progress of specific Research studies, you can find all the Research projects here. 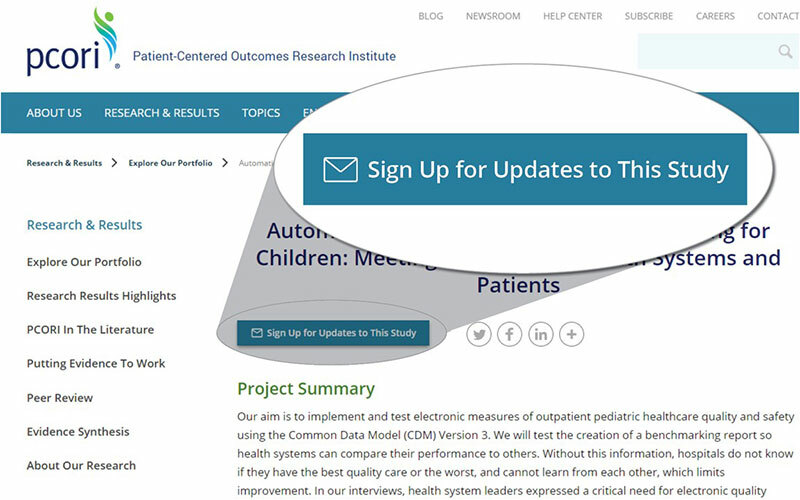 On a project page, click the green "Sign Up for Updates to This Study" button in the upper right corner. You'll receive an email when results are added. I am a neurologist and a neuroscientist with a special interest in Multiple Sclerosis and other neurodegenerative diseases. Please add me on the mailing list! This information will be helpful as I teach students majoring in Health Administration.